They met some people soon after they had got inside, who said they had been there for three-quarters of an hour, and had had about enough of it. Harris told them they could follow him, if they liked; he was just going in, and then should turn round and come out again. They said it was very kind of him, and fell behind, and followed. They picked up various other people who wanted to get it over, as they went along, until they had absorbed all the persons in the maze. People who had given up all hopes of ever getting either in or out, or of ever seeing their home and friends again, plucked up courage at the sight of Harris and his party, and joined the procession, blessing him. Harris said he should judge there must have been twenty people, following him, in all; and one woman with a baby, who had been there all the morning, insisted on taking his arm, for fear of losing him. Harris kept on turning to the right, but it seemed a long way, and his cousin said he supposed it was a very big maze. “Oh, one of the largest in Europe,” said Harris. Harris began to think it rather strange himself, but he held on until, at last, they passed the half of a penny bun on the ground that Harris’s cousin swore he had noticed there seven minutes ago. Harris said: “Oh, impossible!” but the woman with the baby said, “Not at all,” as she herself had taken it from the child, and thrown it down there, just before she met Harris. She also added that she wished she never had met Harris, and expressed an opinion that he was an impostor. That made Harris mad, and he produced his map, and explained his theory. Harris didn’t know, and suggested that the best thing to do would be to go back to the entrance, and begin again. For the beginning again part of it there was not much enthusiasm; but with regard to the advisability of going back to the entrance there was complete unanimity, and so they turned, and trailed after Harris again, in the opposite direction. About ten minutes more passed, and then they found themselves in the centre. Harris thought at first of pretending that that was what he had been aiming at; but the crowd looked dangerous, and he decided to treat it as an accident. Anyhow, they had got something to start from then. They did know where they were, and the map was once more consulted, and the thing seemed simpler than ever, and off they started for the third time. And three minutes later they were back in the centre again. After that, they simply couldn’t get anywhere else. Whatever way they turned brought them back to the middle. It became so regular at length, that some of the people stopped there, and waited for the others to take a walk round, and come back to them. Harris drew out his map again, after a while, but the sight of it only infuriated the mob, and they told him to go and curl his hair with it. Harris said that he couldn’t help feeling that, to a certain extent, he had become unpopular. They all got crazy at last, and sang out for the keeper, and the man came and climbed up the ladder outside, and shouted out directions to them. But all their heads were, by this time, in such a confused whirl that they were incapable of grasping anything, and so the man told them to stop where they were, and he would come to them. They huddled together, and waited; and he climbed down, and came in. He was a young keeper, as luck would have it, and new to the business; and when he got in, he couldn’t find them, and he wandered about, trying to get to them, and then he got lost. They caught sight of him, every now and then, rushing about the other side of the hedge, and he would see them, and rush to get to them, and they would wait there for about five minutes, and then he would reappear again in exactly the same spot, and ask them where they had been. They had to wait till one of the old keepers came back from his dinner before they got out. jerome k. jerome, ‚three men in a boat (to say nothing of the dog)‘, bristol, 1889.
the royal horticultural society: rhs hampton court palace flower show, 30/06 – 05/07/2015. Lilium convalium. Es hat auch vnser libe fraw gesprochen in dem puch der libe: Ich pin ein plvm des tals vnd auch des grvnen waldes. gabriel von lebenstein, ‚von den gebrannten wässern‘, ende des 14. jh. 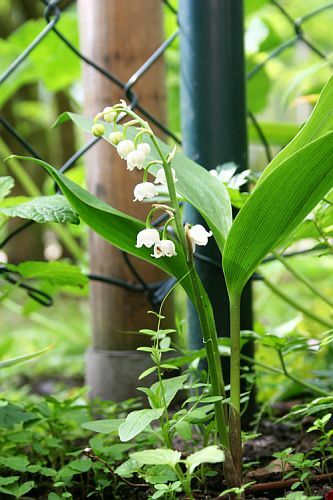 The common Lily-of-the-valley [convallaria majalis] is a true native plant, […]. It is surely needless to recommend it to my readers as a garden ornament, but I may suggest that it might be „naturalized“ in many woods and shrubberies with the best effect – it is so interesting to meet with things like this in an apparently wild state. 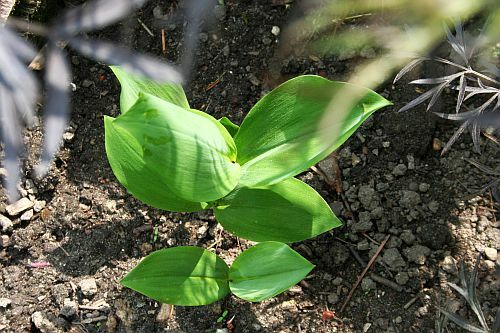 The handsome, graceful Solomon’s-seal (polygonatum multiflorum) and the Lily-of-the-valley should be planted to establish themselves in a wild or semi-wild state in every place which possesses the smallest resemblance to a shrubbery or wood; […]. It is not enough to meet with the Lily-of-the-valley in the garden, we should meet with it in the wilderness, by the woodlands walk, among the Primroses [primula vulgaris] and Bluebells [hyacinthoides non-scripta], and wherever native or hardy plants are cultivated. william robinson, ‚the wild garden: or the naturalization and natural grouping of hardy exotic plants with a chapter on the garden of british wild flowers ‚, london, 1870.
botanischer sondergarten wandsbek: maiglöckchen – giftpflanze des jahres 2014.
blackbox-gardening: mit luhmann im garten? zum thema blackbox empfehle ich ‚cybernetics: or the control and communication in the animal and the machine‘ von norbert wiener (cambridge, mass, 1948) und ’soziale systeme. grundriß einer allgemeinen theorie‘ von niklas luhmann (frankfurt/m., 1984). Gardens that give space to self-sowers have a comfortable, personal feel. These plants fill a gap and are wonderful accessories in our overall aim of keeping the show going. Many people are frightened of self-sowers, thinking that, if allowed, they will lose control and that their garden will look a mess. So they apply thick mulches to prevent this. What they are missing! You need to think of self-sowers as allies that need to be controlled. You‘ ll probably be weeding out 95 per cent of them. That’s all right. Those that remain will do their job all the better for not having too much competition. christopher lloyd, succession planting: self-sowers‘ in the guardian, 27/03/2004, reprinted in ‘cuttings – a year in the garden with christopher lloyd’, london, 2007. Writing on this subject, in the Antiquary, March, 1895, Mr. Harry Hems, of Exeter, introduces the reduced copy of an illustration which appears on the following page, and which he states was published in the Illustrated London News, January 11, 1851.
till some lucky wight guesses aright the peculiar roast the maidens are preparing for their comfort. This done, all enter, and soon right merrily the jovial glass goes round, that man who gained admittance receiving the honour of King for the evening, and till a late hour he reigns, amidst laughter, fun, and jollity. The origin of this custom is not known, but it is supposed to be one of great antiquity. william frances dawson, ‚christmas: its origin and associations: together with its historical events and festive celebrations during nineteen centuries: […] derived from the most authentic sources, and arranged chronologically‘, london, 1902.
wassail kommt aus dem altenglischen oder angelsächsischen: wæs hæl / be you healthy. die ursprüngen liegen vor 1066, der normannischen eroberung unter william the conqueror. wassailing ist ein fruchtbarkeitsritual. in der letzten der rauhnächte, twelfth night, wurde um eine gute ernte gebeten. 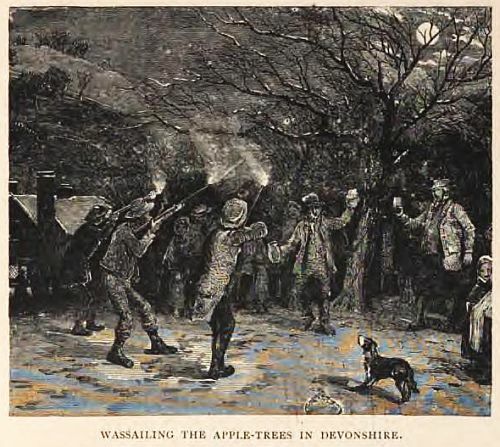 die tradition hat sich besonders in den westlichen englischen grafschaften (devon, somerset, dorset, gloucestershire and herefordshire), in denen viel cider produziert wird, erhalten. als lektüre zum cider empfiehlt sich das 1676 in london erschienene buch ‚vinetum britannicum: or a treatise of cider‘ von john worlidge. als ersatz für das schiessen durch den baum kann man natürlich auch hüte durch die äste werfen, denn das sollte bei einem gut beschnittenen apfelbaum möglich sein. das getränk wassail ist ein mulled cider, glühwein oder punch. es finden sich regional unterschiedliche rezepte. neben cider benötigt man auf jeden fall zucker, zimt, ingwer, und muskatnuss. bei der variante ‚lamb’s wool‘ bratäpfel. auf jeden fall gilt: wæs þu hæl / be in good health! wo ist eigentlich der gute alte → gartenzwerg geblieben? Der Geschmack der Menschen an der Bildhauerey, Malerkunst und Architektur ist meistens sehr eingeschränkt; man muß gelernet haben, ehe man hier bewundern kann; und das Vergnügen an den Werken dieser Künste wird erst durch ein gewisses Maaß von Zeit und Untersuchung interessant, die man ihnen aufgeopfert hat. Allein die Reize eines wohlangelegten Gartens sind ohne Unterricht und Erklärung, den Kundigen und Unkundigen gleich empfindbar. hier beschränkt hirschfeld den garten, leider, auf emotiönchen, was heute, social media, zu „hübschen“ blümchen-fotos aus scheusslichen „gärten“ führt. gärten benötigen ebenfalls „ein gewisses Maaß von Zeit und Untersuchung“… aber das ist ein anderes, viel längeres, thema. Auch die Bildhauerkunst hat nicht unterlassen, an der Verzierung der Gärten, wie die Architectur, Antheil zu nehmen. Statuen und Monumente sind ihre Werke, […]. Statuen mußten bald zu den Verzierungen der Gärten gerechnet werden, da man anfieng, diese als Schauplätze der Pracht, oder als Scenen der Kunst zu behandeln, worinn die Bildhauerey nicht weniger, wie die Architectur, ihren Glanz ausbreiten durfte. Der Römer führte Statuen in die Gärten ein, mehr aus unüberlegender Prachtsucht; der Franzose mehr aus Wahn, daß, was Gebäude ziert, auch Gartenplätzen zukomme. Ohne Zweifel hatten die Römer zuerst Statuen in den Gärten der Griechen gesehen, unter welchen schon Alkamenes eine von ihm verfertigte Venus in seinem Garten zu Athen aufstellte, die nachher der Kaiser Hadrian in seine berühmte Villa [adriana] versetzte. In den letzten Zeiten der Republik und unter den Kaisern, als die Liebe der Kunstwerke ein Theil des herrschenden Luxus ward, brachten die Römer von der Menge der Statuen, die aus Griechenland nach Italien kamen, auch viel in ihre Gärten. Sie gaben hier ihre Gastmale und Feste; sie stellten daher alles auf, was sie nur Prächtiges finden konnten. Man sah hier fast alle Arten von Gebäuden und Kunstwerken, und zwar in einem solchen Ueberfluß, daß Juvenal [’saturae‘, VII., 79-80] die Gärten seiner Zeit mit einem Beywort belegte, das ihnen die übermäßige Pracht vorwarf, worunter alle Einfalt der Natur verschwinden mußte. Doch in den ältesten Zeiten herrschte mehr Mäßigkeit. Man begnügte sich mit einer Statue des Priap [gott der fruchtbarkeit] in der Mitte der Gärten. Terreat ut saeva falce Priapus aves. Columella [in ‚de re rustica‘] erinnert, daß man nicht die Kunstwerke eines Dädalus, Polyclet oder anderer berühmter Bildhauer suchen, sondern sich begnügen solle, den Priap ganz einfältig gearbeitet aufzustellen. Doch folgte man nicht immer dieser Vorschrift. Man machte zu Augusts Zeiten den Priap von Marmor. Nunc te marmoreum pro tempore fecimus. Und in den Servilianischen Gärten zu Rom standen die Statuen der Ceres und der Flora, die Werke des Praxiteles waren. Auch die Statuen der Satyren, als Schutzgötter der Gärten, sah man nach einer Nachricht des Plinius [des älteren, ’naturalis historia‘, lib. XIX, c.4.) aufgestellt. Alle diese Statuen hatten doch in den Gärten der Alten einen Grad von Schicklichkeit, der ihnen in den Gärten der Neuern abgieng; sie waren den Gottheiten gewidmet, unter deren besonderm Schutz, nach der allgemeinen Meynung, die Oerter, die Pflanzen und die Früchte standen. Mit einer gleichen Schicklichkeit stellten die Alten, nach einer Bemerkung des Vitruv [‚de architectura‘, lib. VII, c.5.] in die Zimmer, wo sie sich im Frühling, im Sommer und im Herbste aufhielten, solche Bilder, die auf jede dieser Jahreszeiten immer eine gewisse Beziehung hatten. christian cay lorenz hirschfeld, ‘theorie der gartenkunst’, bd. 3, leipzig, 1780.
ein antinous (antinoo belvedere, hermes andros-farnese), fig. 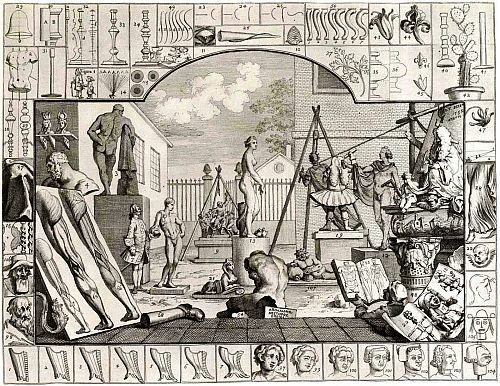 6, wäre doch was… ‘plate I, the sculptor’s yard’ aus: william hogarth, ‚the analysis of beauty‘, london, 1753.
hogarth, the line of beauty & trump: ‚william hogarth, painted by w. hogarth, engraved by benj[amin] smith, from the original picture in the collection of john & josiah boydell, published june 4 ,1795 […] at the shakespeare gallery pall mall‘. kupferstich nach ‚the painter and his pug‘, 1745 (heute in der tate gallery, london). It is to be observed, that straight lines vary only in length, and therefore are least ornamental. That curved lines as they can be varied in their degrees of curvature as well as in their lengths, begin on that account to be ornamental. That straight and curv’d lines join’d, being a compound line, vary more than curves alone, and so become somewhat more ornamental. That the waving line, or line of beauty, varying still more, being composed of two curves contrasted, becomes still more ornamental and pleasing, insomuch that the hand takes a lively movement in making it with pen or pencil. fig. 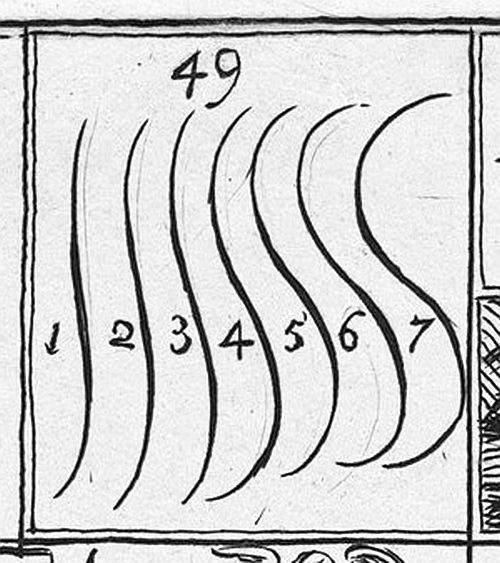 49, ‚plate I, the sculptor’s yard‘ aus ‚the analysis of beauty‘. 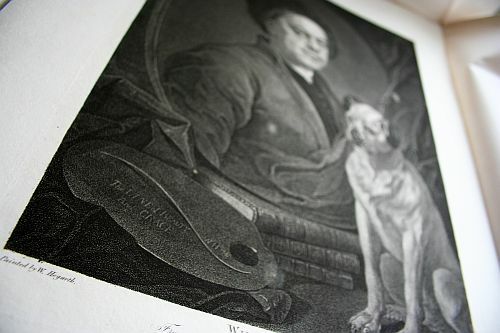 tate gallery: william hogarth, ‚the painter and his pug‘. british museum: william hogarth, ‚gulielmus hogarth‘. london borough of hounslow: hogarth’s house. eine (tudor-)rose von shakespeare oder eine onopordum acanthium / scotch thistle (dt. eselsdistel)? william shakespeare, ’sonnets‘, london, 1609. sonnet CXXX . in malcolm macfarlane , ’songs of the highlands‘, inverness, 1902.